I've at least proven that the theory is sound, although my craftsmanship on this one was crap. I suspect I have the wrong size bobbin in the Brother sewing machine, I may try again on the Elna with the correct bobbin and the foot with the rollers, which seemed to work better. So despite ugly stitching that I would never normally tolerate except it worked well enough for a prototype, I present Hammock 1.0, aka My First Attempt. I'll tighten the rope soon enough, I had to lounge in it a bit to get the rope settled into the end slots and knots tightened. Overall I'm very pleased with it as a first attempt. And considering that the fabric cost me maybe $10 since it was on clearance and that was half the rope in a $11 length, the total cost was about $16 overall. After some more work with tension I'll try again. I may end up installing a post in the back yard so a second hammock can be hung, it's the only way the kids will let me lounge in peace. Very nifty! I think I'd have to put some sort of firmer bottom in mine so I wouldn't jack up my back (any further) by the posture of lying in one. Tightening the rope does much for that, which I did after this picture was taken. You have to lay in it a bit to let the weight tighten stuff up so you know just how it's going to hang. I just tie new knots to make it hang higher up. Having another person around actually didn't help, since it was a 4 year old who was very unhappy that I was taking it down for a moment. One thing I usually see on hammocks that help with support is a horizontal bar at the head and foot. This keeps it spread out. That is another style of hammock, which is good but more difficult to construct because you have to worry about is even distribution of weight across the spreader bars. 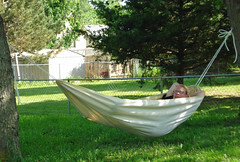 This is more of an easy hammock that anyone with a sewing machine (and the proper needles and foot) can make at home in under an hour. If you look online all of the camping hammocks are the kind without spreaders because they are easier to pack. What model Brother and what model Elna? They might actually take the same size bobbin, because both makers favor the "Class 15." Shoot me an email. I might be able to trouble-shoot the tension problems. Then, thread the machine from scratch. Just before you thread the actual needle, tug on the thread, then lower the presser foot and tug on the thread again. There should be a noticeable difference in tension on the thread. If there is not, rethread and recheck. If you're still not getting good tension, have the machine serviced. I suspect that it's a combination of sewing canvas, needing a walking foot, and trying to use heavy duty thread instead of regular. I'm going to try it on some scrap with regular sewing thread and a walking foot, if it doesn't work that way I may quiz you on possible solutions. And its an Elna SU, which doesn't like universal bobbins. It's a new Brother, not sure the model. Looks perfectly restful, and ideal for this holiday weekend. Despite your con plans.